Marketing is all about making your company’s products and services shine, and the reward you reap for those efforts benefits the company’s bottom line. Beyond the KPIs and ROI, though, wouldn’t it be nice to add something shiny to your trophy case, too? 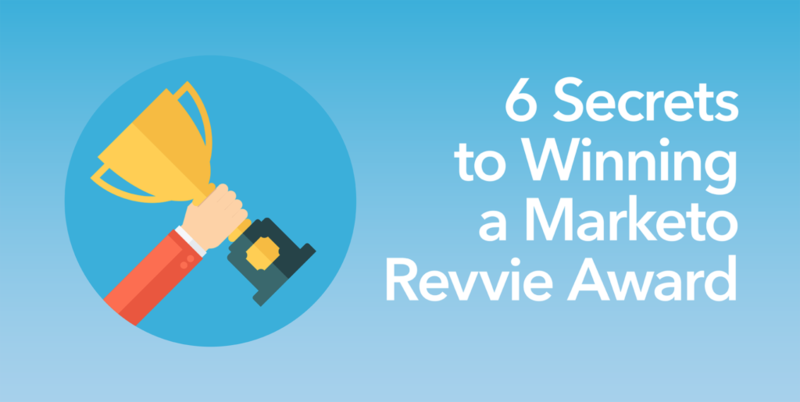 Marketo Summit brings along with it the annual Revvie Awards (not to be confused with Eloqua’s Markie awards), which will be returning to San Francisco in April 2017. The Revvies have several different categories, and it’s time to start thinking about what exciting programs you plan to submit. Over the course of my tenure at DemandGen, I’ve helped several DemandGen clients to submit for and ultimately win Revvies, and here are a few hints to help you bring home your own Revvie next year. #1: Start NOW. Sure, the deadline is months away – most likely in mid-January – but in order to achieve your goal, you need to formulate a plan now. Decide on the category that best matches your strengths as a marketer, then start to plan backward from your goal. That way, you can keep your award submission in mind as you design your programs. Be sure to establish metrics to enable you to demonstrate “before and after” conditions. You also want to allow enough time after your program is implemented to collect and analyze sufficient data to build a convincing case before the deadline. #2: Innovate and inspire. The most successful awards submissions are projects that use Marketo in innovative ways, creatively demonstrating the effectiveness of cutting-edge Marketo features and functionality. Efforts that inspire others are always well received. Choose a project that is highly relevant and appealing to a broad cross-section of Marketo users. #3: Be crystal clear. Make sure your submission’s content is clear and effective. Pick your category and focus on your thesis. If your program is successful in different areas, submit it to multiple categories instead of trying to cover everything in one submission. Metrics are important. If you are just measuring opens and clicks; or aren’t sure how to measure things that roll up to the board room, get a partner that’s climbed the revenue mountain before to help you work meaningful numbers into your submission to make it more effective. Quotes from senior executives, sales and marketing staff — even partners and customers if appropriate – are often compelling. Graphics and video are great, as long as they deliver added value. People can fall into analysis paralysis with diagrams and charts, leading to glazed expressions and whispers of “what is this supposed to mean?” Graphics shouldn’t require extensive interpretation. They are meant to tell a story quickly and easily. Video is also quite helpful when used in tandem with your submission, but make sure it’s short, sweet, and to the point. Aim to be clever and charming with your video, if you opt to go that route; because it will likely be played in front of a huge audience at Marketo Summit if you win. High-level benefits help to convey your program’s impact on the “big picture.” Remember to talk about how your program has improved things like sales and marketing alignment, organizational growth, internal governance, and any other factors that have improved your business holistically. #5: Put your heart into it. Your success is worth celebrating, so tell your story with passion. Your innovation and love for what you do should shine through in your submission. The judges are looking for inspiring stories in the Marketo Community, so be sure to take the time to celebrate the successes of your team. #6: Partner up. Marketo has always encouraged clients to join forces with strategic partners to ensure they are innovating and helping the community to evolve. They even encourage their customers to have their consulting firms help them to develop and even turn in their Revvie submissions on their behalf. So, if you’re feeling overwhelmed with the process, reach out and find a partner to help steer you on a course for success. DemandGen’s team will happily coach you through the entire process of identifying, executing, and submitting your own award-winning program. We would be honored to serve as your trusted guides from the time a Revvie is a glimmer in your eye all the way until your name is being announced at Marketo Summit and the coveted Revvie Award is in your very hands. For some tips and tricks on optimizing Marketo, take a look at our recent white paper, “How to Unlock the Power in Your Marketo Programs.” If you’re curious about how DemandGen can help contact us! Lauren McCormack is a Campaign Engagement Manager specializing in data-driven digital marketing, demand generation, content marketing, team leadership, and marketing strategy.